Ready for a bit of idea-powered rocket science? Rule number one for a successful business start-up: Give people something they love. Rule number two for a successful business start-up: Give people something they can’t get anywhere else. Ah ha! Yes, you have! 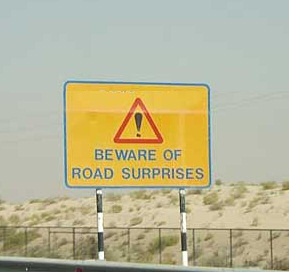 Now then, people love surprises do they..? Wait a minute – that fits the first rule for a successful business start-up! Now, I wonder… How about the second rule? Can people get surprises anywhere else (other than the business I am obviously going to suggest you set up in a minute)? “Of course,” you are saying, “I get surprises every Christmas from a fat, bearded, foreign burglar.” Yes, very good. And you have to wait all year. But in the meantime, where can you get surprises for yourself? Set up a business that sells surprises. The idea is that people don’t find out exactly what they’re getting until they’ve bought it. Sounds great for a novelty, but I think selling surprises can be practical as well. Personally, I get overwhelmed by the amount of choice available in every circumstance. While my mind has evolved to choose between hitting another ape with a stick, or hitting him with a rock (still actually a key decision in some Newcastle bars), I am more likely to be faced with the sandwich selection in Tesco Express. And break down in tears. The Hipstery makes more practical sense. It’s an online T-shirt store that’ll sell you a T-shirt with a hip and mystery style – you just give them your size. It’s genuinely a good option for someone who just wants a cool T-shirt but can’t be bothered to shop. Ideal! Who wants to stand choosing between pasta salads for 35 minutes of a half hour lunch break? Not me. Supply me with a lunch bag please, and let me have that in-flight meal excitement every day of the working week. Same in the evening. I am wasting my home time in Tesco Express! Put my dinner in a brown bag and let’s be done with it. Perhaps you could offer me a token of autonomy by labelling bags “Healthy”, “For Gluttons” or “An Indian”. And make them good, or I won’t trust you next time! Outfits. I want whole outfits. Whatever I’m not suited with in terms of style, will be more than made up for by the fact that I did not make this mess of myself – as fashion dictates that everyone do – plus the thrill of the surprise! I’d say some labels like ‘Gansta Outfit’, “Person With “Unique” Style’ or ‘Middle-aged Man On Mediterranean Holiday’, will ensure I get more or less what I’m looking for. What a terrible shame. Of course, you could just do individual items like ‘T-shirt’ or ‘jacket’, but that would be a weak move. We all know that music should be free, and largely is, but how about making monthly mix CDs of some random upcoming artists so people can give them as presents (e.g. ‘Rock’, ‘Hip hop’). The artists would be pleased to be featured and may not even want royalties. Alternatively, providing these mixes as podcasts or for free download on your website would be a good way to draw traffic. Red Letter Day style. People who book it just turn up at your store and you take them away to do something for the day. Obvious things would be paintballing or racing cars. Less obvious would be blindfolding everyone and leaving them in a forest. (Easy way to make money though.) Horses for courses. The most extreme, and best, part of the business. You sell holidays with surprise destinations. Preferably charter a flight and get the airport to put the destination code as ‘SUR’. I did this with some friends at university when Ryan Air started offering free flights. We scrolled down the list and bought tickets to the first place we hadn’t heard of. Ended up going to Klagenfurt. Great trip! I love the idea of a bricks & mortar store that only sells surprises. Have you seen Anything? It’s a Singapore beverage company that caters to consumers who respond to “What would you like to drink?” with a non-committal “anything” or “whatever”. A few years ago, they launched two complementary brands: Anything and Whatever. Consumers don’t know which flavour they’re getting until they take a sip. Cans are simply labelled Anything and Whatever, and the list of ingredients is limited to generic wording: carbonated water, sugar, permitted flavouring, permitted colouring, preservative, tea extract, fruit juice concentrate. You decide when and where you fly from and also what sort of a holiday you want. After you enter your details and complete the booking, they tell you where you’re going and you can get planning! Simply select your departure airport and the type of holiday you want by clicking on “Party”, “Snow and Skiing”, “Shopping”, “Christmas Markets”, “Metropolis Eastern Europe”, “Metropolis Western Europe” and “Culture”. Among millions of good articles on different blogs this article is the best, it’s so informative and was written professionally, reading articles like this one make me feel good. You post surely was one of the highest points of my Saturday. I was on Google searching for something totally unrelated when the title caught my attention. I’m glad I took the time to read your post! Feel free to check out my blog at Introduction To Welding if you get bored! and i help ideate/plan and execute surprises.